My satirical look at old Romance Comics from the 1940s and 50s. Each chapter combined with new art and text. Hey, you might even pick up some dating tips. How do these stories hold up in the 21st century? Let's see what our two readers, "The Silo Girls" think. You may even get some love advice. It would really help me if you would tell me what you think about it and subscribe. Please help me to get 600 subscribers and please the rate the comic. You may check them out on the platform of your choice Webtoon or Tapas. 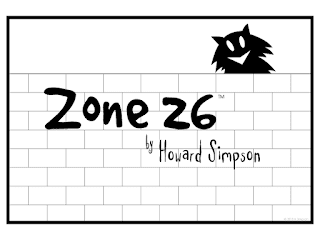 Zone 26 is where anything can happen and usually does! Use your good eye while you are here, as things are not what they appear to be at first glance. Zone 26 is a black and white world. "It's like Cartoon Jazz," says Jon (Superman) Bogdanove. Please help me to reach my goal of getting 250,000 views. Please share and comment. I like to know what you think. Repeated views count, so come back often. Please help me to get 600 subscribers and please the rate the comic. Check out my webcomic Tangent City - Don't Go There! The place no serious artist wants to go. 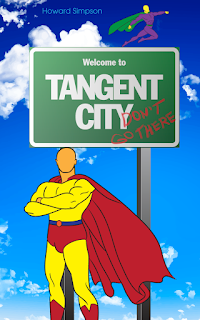 The number one killer of depth in art is tangents. A look at how to take the detours. Please share and comment. I like to know what you think.